Z Digital Studio is your connection to a new way of doing business.Technology has become endemic in the lives of billions of people around the world, and as a result, the old ways of doing business are no longer sufficient. While integrity, professionalism, creativity and diligence are still the core tenets of any successful business, they are too often overlooked in this fast paced society that routinely focuses on instant gratification. Z Digital helps businesses plug into the new networks that technology and instant worldwide communication have made possible. Potential customers in this age of technology are different than they’ve ever been before, and as such, any business who hopes to capture their loyalty must cater to their habits and their needs. Often, when running a business, the owners are so involved in the day to day operations that they are unable to see the bigger picture. What obvious components are missing and what mistakes are they making? Are they unnecessarily hemorrhaging cash? Are they leaving money on the table? We are adept at putting fresh eyes on your business, and quickly assessing your situation. We’ll root out those hidden sources of aggravation and make sure that your bottom line is as healthy as it should be. No one can be good at everything. Too often businesses are run by good people who are experts at the subject of their business, but they are woefully prepared for the many other challenges that come along with running that business. Finances, Marketing, Customer Care and Communication, Regulatory Compliance, Technology Concepts, Price Structure Analysis, etc…. It is very likely that the costs of hiring Z Digital Studio will be recouped in a very short period of time as the results of their hard work begin to take effect. 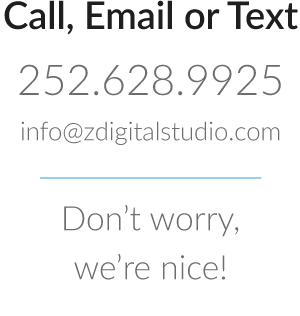 Do yourself a favor – discuss your business with Z Digital Studio, and prepare to be impressed !